Mumbai: One year on from the deadly militant attacks in Mumbai, the city remembered its dead in solemn prayers and candlelit vigils. At the attack sites, a steady stream of mourners mixed with curious visitors and locals. The Leopold Cafe, one of the targets, was packed with tourists. Staff, who lost two colleagues, wore black armbands over their red polo shirts; commemorative mugs were on sale. At the Taj Palace hotel and Tower, where 31 people were killed, bosses said they wanted to treat the first anniversary like any other working day, with a private memorial service for staff in the evening. At the city’s main railway station, the Chhatrapati Shivaji Terminus (CST), a blood donation session was organized instead of a high-profile commemoration. 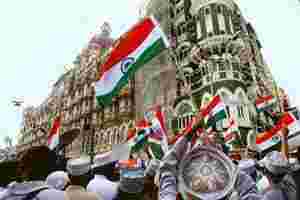 CST was the scene of the bloodiest episode of the attacks, with 52 dead. Nariman House, until last year a little-known Jewish cultural and religious centre, staged a memorial service. Six people died there, including the rabbi who ran it and his pregnant wife. Earlier in the morning, a fleet of new camouflaged, armoured vehicles and rapid intervention vehicles manned by commandos with guns drawn made its way down Marine Drive as a marching band played. Diplomats from Canada, Britain, France, Germany, Israel, Italy and the US lit candles in memory of people from their countries who died. Muslim, Christian and Parsi leaders from India lit candles in memory of the Indian dead. Prime Minister Manmohan Singh led tributes to the 166 people who were killed. “The government will not rest till we have brought the perpetrators of this crime to justice. This is our solemn duty," Singh said from Washington, where he is on a visit to boost ties with the US. Silent tributes were held in Parliament and before India’s cricket Test match with Sri Lanka. World leaders expressed support for India’s battle against militants, with British Prime Minister Gordon Brown saying he would “work shoulder to shoulder with India and our international partners to confront this common threat." Ceremonies were also held in New Delhi, Vadodara and Melbourne, among other places.